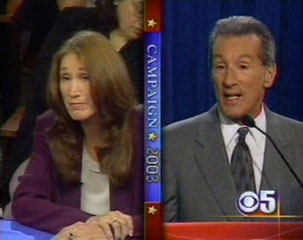 On Lisa Rein's Radar: Tom Ammiano Clips From The October 14 Mayoral Debate - Part 2 of 4 - Tom On "Care Not Cash"
Tom Ammiano Clips From The October 14 Mayoral Debate - Part 2 of 4 - Tom On "Care Not Cash"
I think Tom Ammiano is the best choice for the next mayor of San Francisco. This clip is from the Mayoral Debate that aired on KPIX Channel 5 on Tuesday, October 14, 2003. Taylor: "Supervisor Ammiano. Voters, as you well know, passed "Care Not Cash" by a fairly substantial margin. But you opposed its implementation at the Board. As Mayor, would you continue to ignore the wishes of the voters if you don't agree with them?" Ammiano: "I think that we did honor the wishes of the voter by voting on the "Real Care, Real Services" proposition, or I guess I should say "resolution," passed by the Board at the behest of Supervisor Daly and Ma. We did change the fact that we were saying, not "shelter," but real "housing." And the Mayor signed off on it. So, in my mind, we did honor the will of the voter. And then I think there's a bigger question here too: what was the will of the voter, aside from the very specifics of "Care Not Cash," and that was to provide solutions, which are housing and services. I have worked through the Department of Public Health to get a grant for six million dollars from HUD, working with the Mayor's office, about providing that supportive housing, and that's going to start immediately. And I think that does also honor the will of the voters. So, while I did oppose "Care Not Cash" in its conception on the ballot, and then the judicial system thought we shouldn't do it, and then our Budget Analyst thought we shouldn't do it -- we still went ahead and did endorse the will of the voters. And we had to make some compromises about that and that's what this situation's all about." Taylor: "Some might call that just political spin. The real question is: What's your view of when voters pass something? Do you feel that you have an ob(?) that's just advisory in nature? Or that you can put whatever your interpretation might be on the situation and act accordingly?" Ammiano: "It's not so much my interpretation, but I do think that certainly, primary to me, is honoring what the voters want. And that doesn't just happen out of context. They might want something that's illegal, which is what the judiciary decided. They might want something that really can't happen because they weren't given the full information, as the Budget Analyst has said. So, you know, in honoring the will of the voters, you want to be there for them, and then you also want to take those other things into consideration. Spin or not spin, it's all about solutions. And "Care Not Cash" did have some deficiencies that I think we've taken care of."